As a pastor and a continual student I do a lot of resourcing, especially on Biblical and theological subjects. Below you’ll find an alphabetical list of subjects with the resources I recommend. Be aware that some of these are academic resources and may not be accessible to everyone. Resources prefixed with an asterisk are “must haves” on the subject. *Keller, Timothy J. The Reason for God: Belief in an Age of Skepticism. New York: Riverhead Books, 2009. Kreeft, Peter, and Ronald K. Tacelli. Handbook of Christian Apologetics: Hundreds of Answers to Crucial Questions. Downers Grove, Ill.: InterVarsity Press, ©1994. *Craig, William Lane. Reasonable Faith: Christian Truth and Apologetics. 3rd ed. Wheaton, Ill.: Crossway Books, ©2008. Duguid, Iain M. Living in the Gap between Promise and Reality: The Gospel According to Abraham. second ed. The Gospel According to the Old Testament. Phillipsburg, New Jersey: P & R Publishing, 2015. Hamilton, Victor P. The Book of Genesis: Chapters 1-17. The New International Commentary On the Old Testament. Grand Rapids, Mich.: W.B. Eerdmans, 1990. Mathews, K A. The New American Commentary. Vol. v. 1A-1B, Genesis. Nashville, Tenn.: Broadman & Holman Publishers, 1996-2005. Walton, John H. Genesis: From Biblical Text… to Contemporary Life. The Niv Application Commentary. Grand Rapids, Mich: Zondervan, ©2001. Cundall, Arthur Ernest, and Leon Morris. Tyndale Old Testament Commentaries. Vol. 7, Judges and Ruth: an Introduction and Commentary. Downers Grove, IL: IVP Academic, 2008. *Davis, Dale Ralph. Judges: Such a Great Salvation. Focus On the Bible. Fearn: Christian Focus, 2000. Wilcock, Michael. The Message of Judges: Grace Abounding. The Bible Speaks Today. Leicester, England: InterVarsity Press, ©1992. *Block, Daniel Isaac. The New American Commentary. Vol. 6, Judges, Ruth. Nashville, TN: Broadman & Holman Publishers, ©1999. Webb, Barry G. The Book of Judges. The New International Commentary On the Old Testament. Grand Rapids, Michigan: William B. Eerdmans Publishing Company, 2012. Younger, K Lawson. Judges and Ruth. 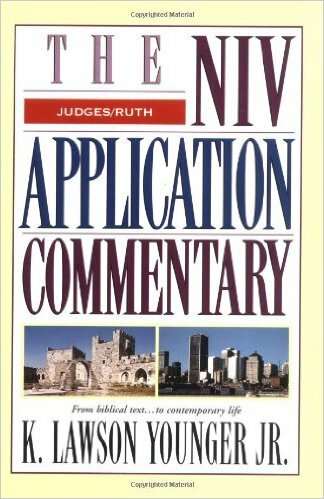 The Niv Application Commentary. Grand Rapids, Mich.: Zondervan, ©2002. *Carson, D A. The Gospel According to John. Pillar New Testament Commentary. Leicester, England: Inter-Varsity Press, 1991. *Köstenberger, Andreas J. John. Baker Exegetical Commentary On the New Testament. Grand Rapids, Mich.: Baker Academic, 2004. *González, Justo L. The Story of Christianity. 2nd ed. New York: HarperOne, 2010. *Peterson, Eugene H. Eat This Book: A Conversation in the Art of Spiritual Reading. pbk. ed. Grand Rapids, Mich.: Eerdmans Pub Co., 2009, ©2006. *Keller, Timothy. Prayer: Experiencing Awe and Intimacy with God. New York: Dutton, Penguin Group USA, 2014. *Feinberg, John S., and Paul D. Feinberg. Ethics for a Brave New World. 2nd ed. Wheaton, Ill.: Crossway, 2010. Holmes, Arthur F. Ethics: Approaching Moral Decisions. second ed. Contours of Christian Philosophy. Downers Grove, Illinois: InterVarsity Press, 2007. Rae, Scott B. Moral Choices: An Introduction to Ethics. 3rd ed. Grand Rapids, Mich.: Zondervan, ©2009. *Heimbach, Daniel R. True Sexual Morality: Recovering Biblical Standards for a Culture in Crisis. Wheaton, Ill.: Crossway Books, ©2004. *Copan, Paul. Is God a Moral Monster? Making Sense of the Old Testament God. Grand Rapids, Mich.: Baker Books, ©2011. Meister, Chad V. Introducing Philosophy of Religion. London: Routledge, 2009. Corduan, Winfried. No Doubt About It: The Case for Christianity. Nashville, Tenn.: Broadman & Holman, ©1997. *Sire, James W. The Universe Next Door: A Basic Worldview Catalog. 5th ed. Downers Grove, Ill.: InterVarsity Press, 2009. Erickson, Millard J. Christian Theology. 3rd ed. Grand Rapids, Mich.: Baker Academic, 2013. *Grudem, Wayne A. Systematic Theology: An Introduction to Biblical Doctrine. Leicester, England: Inter-Varsity Press, 1994. Geisler, Norman L., and William E. Nix. A General Introduction to the Bible. rev. and expanded. ed. Chicago: Moody Press, ©1986. *Saucy, Robert L. Scripture: Its Authority, Power, and Relevance. Swindoll Leadership Library. Nashville, Tenn.: Word Pub., ©2001. Feinberg, John S. No One Like Him: The Doctrine of God. [rev. ed. Foundations of Evangelical Theology. Wheaton. Ill.: Crossway Books, 2006. *Demarest, Bruce A. The Cross and Salvation: The Doctrine of God. Foundations of Evangelical Theology. Wheaton, Ill.: Crossway Books, 2006. *Keathley, Kenneth. Salvation and Sovereignty: A Molinist Approach. Nashville, Tenn.: B & H Academic, ©2010. *Lovelace, Richard F. Dynamics of Spiritual Life: An Evangelical Theology of Renewal. Downers Grove, Ill.: Inter-Varsity Press, ©1979.